President Nana Addo Dankwa Akufo Addo, has revealed that the 2018 budget statement and fiscal policy to be delivered on Wednesday November 15, 2017, will focus largely on job creation. The President said the budget will give meaning to his government’s industrialization agenda which primarily focuses on the creation of jobs. 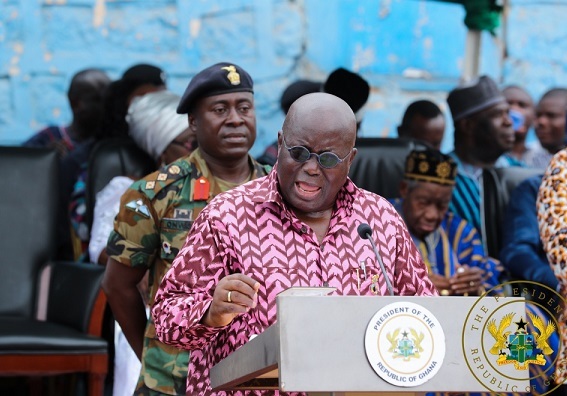 Speaking at a durbar of Chiefs and people of Ga Mashie at Mantse Agbona on day two of his tour of the Greater Accra Region, the President said the budget will also play a key role in strengthening Ghana’s economy. The Finance Minister, Ken Ofori-Atta, is expected to present the 2018 budget statement to Parliament next week Wednesday. This would be the second budget of the Akufo-Addo administration to be presented by the Finance Minister Ken Ofori-Atta, after his first in March 2017, christened the Asempa budget. There was heavy interest in the 2017 budget statement from stakeholders in all sectors of the economy, due to the number of promises made by the government during the 2016 election campaign. Among the highlights of the 2017 budget, were the withdrawal of the 1 percent Special Import Levy, 17.5 percent VAT/NHIL on financial services, and 17.5 percent VAT/NHIL on selected imported medicines, that are not produced locally. The 17.5 percent VAT/NHIL on domestic airline tickets and levies imposed on kayayei by local authorities were also removed. Aside job creation, there are other areas that government intends focusing on in the 2018 budget. Mr. Ofori Atta had earlier stated that the 2018 budget will also focus on using innovative ways to improve domestic revenue collection for economic development. He revealed this in the wake of calls from the Institute of Fiscal Studies urging government to use the 2018 budget to improve tax collection by broadening the tax base.